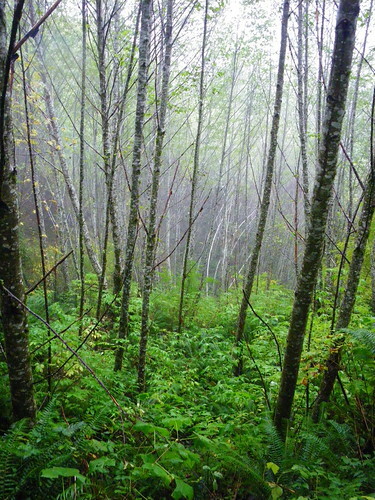 Red Alder Ranch is owned and operated by Mark Whitaker. I have 15 acres of land in the Willapa Hills of Washington State, a few miles away from the Columbia River. Like a lot of people in this rural county, I have several jobs. I have been running a Wood-Mizer portable sawmill since 1995, milling wood of all kinds from old growth cedar logs salvaged from the river to fruit trees that have been removed from people's yards and everything in between. I also design alternative energy systems, and sell the components, too. For over five years, my family lived "off the grid", getting our electricity from solar panels and sometimes an old, noisy generator. I'm also a co-owner of Columbia River Kayaking, LLC. From about April through the end of October, I am a sea kayak guide and coach. I take a lot of pictures, and write a blog. I play around a little with web development, and sometimes sell things like specialty woods and solar panels on ebay. I grow shiitake mushrooms on alder logs, and a garden. I build kayaks, and do an awful lot of "messing about in boats". Welcome to Red Alder Ranch! All images and text are copyright by Mark Whitaker unless otherwise noted and may not be used without the prior written approval of the copyright holder.